Ugh, the Gregorian calendar is so boring. That’s why we’re disrupting monthly series with a lunar cycle-based series about the best patents of the last synodic month, picked by the PatentYogi team. Get ready when that moon gets gibbous, y’all. The September-ish roundup lands on the beautiful Harvest Moon! As of this month, the US patent office issued over 17,000 patents and published over 21,000 patent applications. Each patent asset adds a little something new to the human knowledge base. As I cannot list all these patent assets here, the PatentYogi team and I have selected the five most interesting patent assets. Although smartphones are an essential utility now, they can be a source of frustration as well. With numerous different UIs and ever-increasing updates to the operating systems, it can become frustrating to navigate through the host of features and settings in smartphones. For example, how often does it happen that you aren’t able to locate a setting that you just used a couple of days ago? Google has come up with a solution. In a recently published patent application, Google has disclosed a method for “determining user frustration and assisting the user in response.” The smartphone receives signals from sensors including accelerometer, compass, GPS, touchscreen, and even the microphone and camera. Based on the received signals, the smartphone will determine whether a user is having difficulty navigating the smartphone and performing a task. For instance, putting pressure on the smartphone screen above a predetermined value, vigorous shaking of the smartphone (as determined from the accelerometer), frustrated voice intonations or speech patterns (as recorded using a microphone), frequent exploration of menu options, and frustrated facial expressions (recorded from the front-facing camera) may all be indicative of user frustration. With Google’s new system, your smartphone might one day ask you(through visual, or auditory means) if you’re in need of assistance in performing a certain task, and then actually help you do it. For instance, the smartphone may remember recently changed settings, and could ask you if those are the settings you wanted to change. A recent patent publication disclosed Microsoft’s new multi-talker speech recognizer that can identify words spoken by multiple people at the same time. Until now, it has been hard to program computers to accurately identify sounds of multiple people. However, according to the patent, you and your friends will be able to speak to Cortana (Microsoft’s virtual assistant) at the same time and ‘she’ will recognize and understand statements you make separately. With Microsoft’s multi-talker speech recognizer, audible speech from multiple people will be recognized as precisely and accurately as speech from a single person. Microsoft’s multi-talker speech recognizer consists of a microphone that will collect mixed speech from multiple users (talkers). There can be more than one microphone that can collect the audio signal from more than one user. The mixed speech is then processed by a PIT separator for separating the audio signal into multiple speeches of the multiple users (talkers). The PIT separator employs permutation invariant training (PIT) of deep learning models for speech separation such that an error in an output may be as minimum as possible. Further, the permutation invariant training (PIT) of deep learning may separate the mixed speech based on an utterance criterion. The utterance criterion allows the PIT separator to assign and/or separate the mixed speech based on an utterance (such as words, vocal sound, and/or other non-linguistic sounds) in the mixed speech. For example, the image above shows a simple case where there are two utterances, utterance 1 (302) and utterance 2 (304) that will be separated and labeled at a labeler (306). Further, the outputs may be labeled as either output layer 1 or output layer 2 for two speakers (say speaker 1 and speaker 2). When the beta version of Google Glass was released for purchase to “Glass Explorers,” it generated much excitement. However, some glaring issues in the design led to the Glass being a handful to use. Not to mention an overall lack of utility, which also emerged from the clunky looks and feel of the Glass, which made it a novelty as opposed to a piece of tech that would be adopted by the masses. Long story short, it was obvious it could never reach mass production and mass adoption. However, Google hasn’t given up and has kept working on the design, and it seems the tech giant has major improvements up its sleeve. 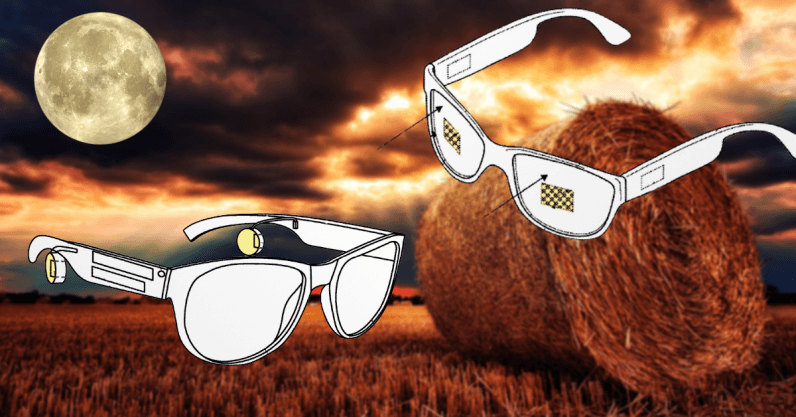 In two recently published patents, Google has disclosed a “see-through curved eyepiece with patterned optical combiner” and a “bone conduction transducer with a magnet anvil.” The first patent talks about a wearable head mounted display. The curved eyepiece will include a display panel, two lens bodies, combined by an optical combiner, the first of which includes a light guide. The curved eyepiece will receive display light generated by a display panel through an input surface. It will also emit display light in an eye-ward direction in the viewing region towards a user‘s eye. The display light is guided through the light guide by total internal reflection between the input surface and optical combiner. The curved eyepiece will be thin, with a possible thickness around 4 mm. The thickness may be reduced by the use of transparent optical grade plastic with a high refractive index, which also leads to a higher viewing area. In addition to that, the curved eyepiece may be manufactured to provide prescriptive lensing to ambient light. That mean the curved eyepiece may also be used by people who need glasses! The second patent refers to a new a bone conduction transducer (BCT) to provide audio in wearable devices. The BCT is made of a yoke and a pair of arms protruding from it (basically glasses). The BCT is made up of numerous components — such as high permeability steel surface, metal coil, etc. — but the most distinct feature is two diaphragms placed on a pair of springs at the ends of the arms of the glasses (in yellow on the image above). Instead of normal speakers, the diaphragm will vibrate based on a signal received from the metal coil. The vibrations will travel through the wearer’s skull to the middle or inner ear, which the brain will then interpret as sound. The US Air Force has come up with a wideband RADAR system that will allow them to identify or authenticate a person by analyzing their bone structure. Just like fingerprints, a skeletal structure of a person is a unique biological characteristic that can be used to authenticate a person’s identity. The wideband RADAR system uses electromagnetic radiations of frequency and power spectral density in a range such that the electromagnetic radiations penetrate through the skin tissues, muscles, and fat of a user’s body in order to reach the bones but do not overheat any human tissue. Once it reaches the bones, some of the EM radiation gets absorbed by the bones while the rest reflects towards a receiver which captures the placement of the bone, effectively creating a biometric signature of the user — without hurting him. This technology will allow the US Air Force to quickly authenticate users without requiring them to undergo elaborate authentication protocols. Look out for the latest lunar cycle-based patent update every full moon. Next up is Hunter’s Moon in late October, which is also known as Blood Moon. Scary!